As the former designer for Pucci, Matthew knows a thing or two about doing tropical designs. Thankfully, he stays away from going fully resort a la Tory Burch, and thus his airy designs are wearable year-round. 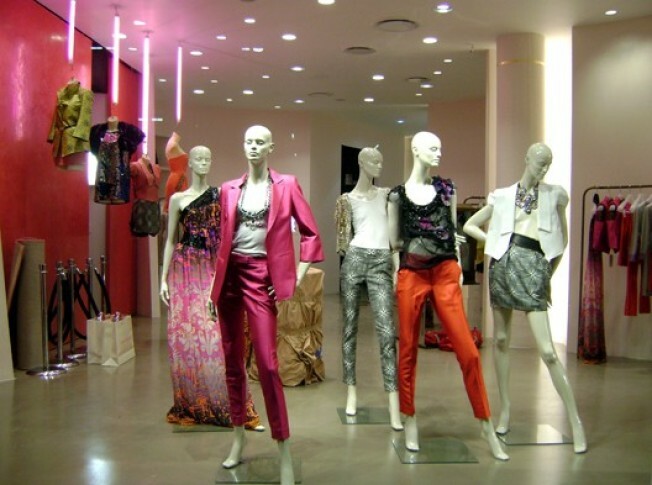 In fact, that pink jumpsuit on Heidi Klum during the Project Runway finale looks pretty familiar; could it be the very one featured in the store window? We think so! Should you find yourself wandering through the Meatpacking District this weekend, do stop in and check out Matthew's new digs, because it looks like he's got the Amazon rainforest hiding back there, just like in his London store. Let us know what all you find back there, as we're steering clear of fuchsia pantsuits until summer (or forever).